FEI Company makes market-leading instruments, such as focused ion and electron beams (FIB, SEM, and Dual Beam), to investigate small defects and structures in materials at micro-/nano-scales. On the other hand, the company also provides TEM, SNP, and SIMS tools. Historically, the company was founded by Dr. L.W. Swanson, Mr. N.A. Martin and Mr. L. Swenson as Field Emission Inc. in 1971 to supply electron and ion beam sources for field emission research and electron microscopy. As its fourth partner, Dr. J. Orloff, who was working on electrostatic optics for field emission ion and electron sources, joined the company in 1978. FEI introduced liquid-metal ion source (LMIS) to the semiconductor industry for mask repair and defect analysis in 1981. The current FEI company has been a combination with Philips Electron Optics since 1997 and had been further expanded by acquiring the ion beam company Micrion in 1999. Figure 2448. 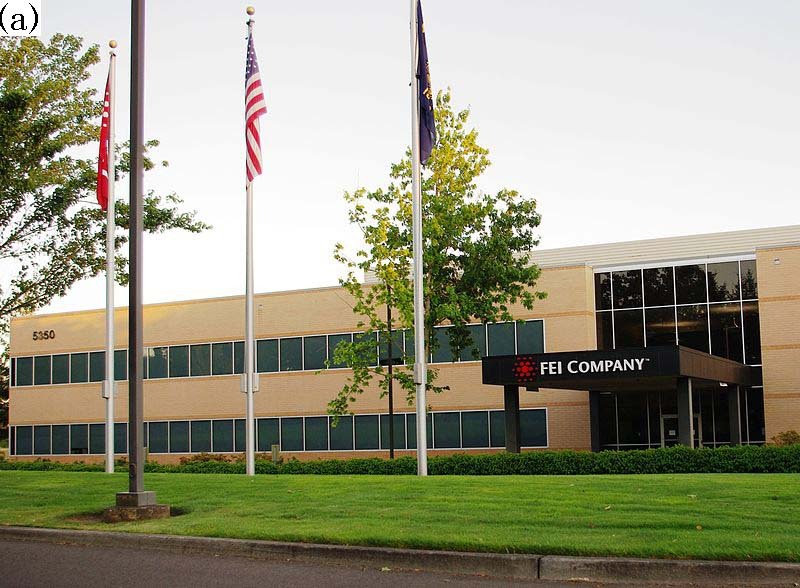 FEI Corporate headquarters.